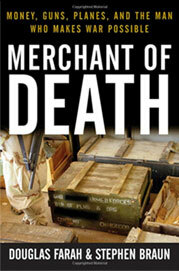 The Wonderfilm Media Corporation announced last month its acquisition of Douglas Farah’s and Stephen Braun’s book “Merchant of Death” for development as a television series. The book profiled Russian arms dealer Viktor Bout and the efforts of a group of transnational crime experts to target him in the immediate years before Bout was captured by U.S. narcotics agents in a 2008 sting operation that led to his conviction and imprisonment. Wonderfilm said it is partnering with Anthony Zuiker, creator of the CSI crime series franchise and Jason Hervey through a new company, Zentraoquist LLC, and with Craig Piligian, of Pilgrim Studios, a subsidiary of Lionsgate, a veteran Hollywood film operation. The company said that Jeff Bowler, an Emmy Award-winning producer and executive and one of the four founders of Wonderfilm, has packaged “Merchant of Death” and will serve as executive producer in the project with his Wonderfilm partners. The production team will also include Joseph Giallombardo and Alexandre Coscas. VANCOUVER, BC / ACCESSWIRE / September 5, 2018 / The Wonderfilm Media Corporation (TSX-V: WNDR) (OTC PINK: WDRFF), (“Wonderfilm” or the “Company”) is pleased to announce the acquisition of the bestselling book, “Merchant of Death,” written by Pulitzer Prize winner Stephen Braun and Douglas Farah.